This B&H Custom Workstation combines the HP Z6 G4 Series Tower Workstation with 32GB of 2666 MHz DDR4 RAM in a 4 x 8GB configuration, an HP Quadro P5000 graphics card with 16GB of GDDR5X VRAM, a 256GB SATA III 2.5" internal SSD, a 2.5" to 3.5" hard drive adapter bracket, and B&H installation services. Enjoy smooth rendering of 3D models, compiling of programming codes, and handling of other intensive tasks with the Z6 G4 Series Tower Workstation from HP. Under the hood, an Intel Xeon Silver 4114 processor can be found along with 8GB of DDR4 ECC RAM that will accompany it. Never sacrifice performance with ten processing cores running between 2.2 and 3 GHz, while the ECC RAM automatically detects and corrects errors to help prevent data corruption. Beyond memory correction, a 3.5" 7200 rpm hard drive is on board to provide 1TB of digital storage space for storing documents, photos, videos, and more. Windows 10 Pro 64 for Workstations is installed on this drive. 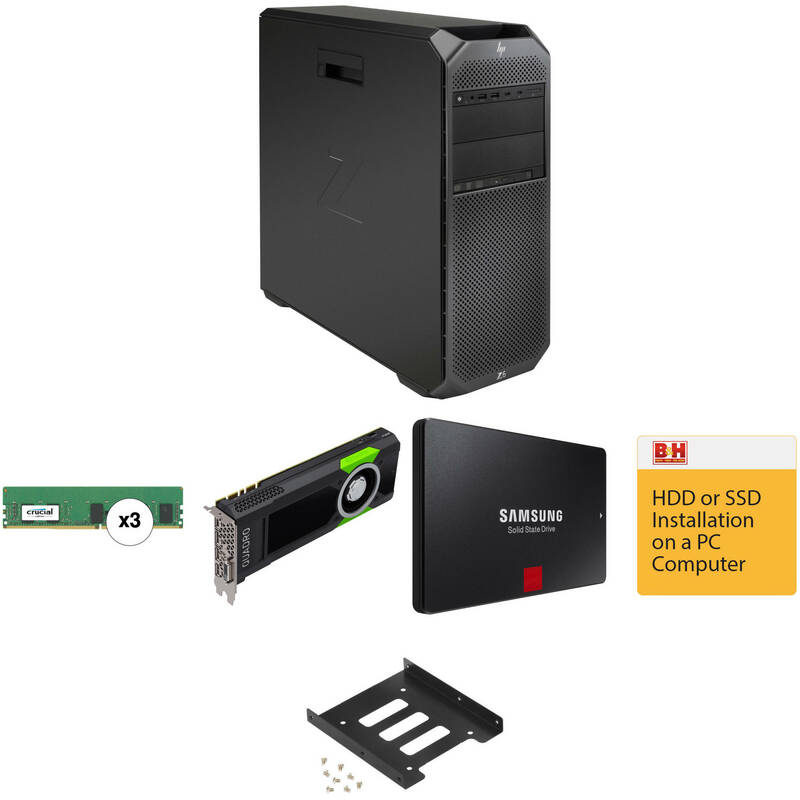 Furthermore, HP has designed this Z8 G4 workstation with no integrated or dedicated graphics processing unit included, so you can tailor this system for your needs with a user-supplied graphics card. As for connectivity, you'll find two Gigabit Ethernet ports as well as ten USB 3.0 ports, with one of the USB ports supporting device charging. Other notable connections include one headset connector, audio-in, audio-out, PS/2 mouse, PS/2 keyboard, and serial. There's also a slim HP DVD writer for recording memories on to optical media. The expandability features on the HP Z6 G4 start with one 2.5"/3.5" internal bay as well as two M.2 slots and two 5.25" external bays. The workstation is armed with three PCIe 3.0 x4, one PCIe 3.0 x8, and two PCIe 3.0 x16 slots to enable support for optional Thunderbolt 3 cards, RAID controllers, and other useful PCIe cards. For accommodating up to 192GB of memory modules, a total of six memory slots are available. Additionally, the Z6 G4 can support a second sold-separately processor to further enhance the system's capabilities. B&H Photo is an authorized HP reseller with professional in-house technicians available for upgrades & installations on these workstations and laptops. Built with power and speed in mind, the Z Series system is designed to enhance audio and video post-production workflows and more by sporting a range of top-tier processors and large RAM loadouts. Each workstation comes with a 3/3/3 limited warranty - 3 years for parts, 3 years for labor, and 3 years of repairs performed at customer site for those parts not eligible for Customer Self Repair (CSR). For 24/7 customer service, please call 1-800-334-5144. The 8GB DDR4 2666 MHz RDIMM Memory Module from Crucial is a x8-based, single-rank memory module for 288-pin DDR4 compatible systems. Moreover, it's registered, ECC, and has a CAS latency of 19. Add additional RAM to your system to increase its overall and multitasking performance. Designed for generating high-resolution graphics and large datasets for VR, graphic design, and advanced calculations, HP's Quadro P5000 Graphics Card can beef up your workstation to increase performance. Based on NVIDIA's 16nm Pascal architecture, the Quadro P5000 features 2560 CUDA cores coupled to 16GB of VRAM with a 256-bit memory bus providing a maximum of 8.9 TFLOPS of single-precision computing power. Using supported APIs and CUDA, that computing performance can translate into high resolution and realistic real-time 2D and 3D graphics rendering or improved computing speed with hardware acceleration. The output panel on this card features four DisplayPort terminals and a dual-link DVI-D port. Up to four monitors can be simultaneously supported by a single card, without any extra hardware, to create high-resolution video walls with your workstation or for more desktop real-estate to increase productivity. DisplayPort 1.4 support allows this card to drive UHD 5K displays as well. The DVI port can be used for connecting to legacy hardware while separately available adapters can be used with this card to drive other kinds of displays and projectors. For cooling, the P5000 uses a blower-style cooler. This cooler uses a radial fan to force air through the card's heatsink and out through the rear of the case. This cooling configuration can be used in crowded workstation environments with multiple GPUs or where space between computer components can be a concern, as hot air is not recirculated back into the case. NVIDIA's parallel computing platform which enables an increase in computing performance by harnessing the parallel nature of GPU processing. CUDA compatible applications can assign intensive parallel computing tasks, such as real-time video rendering, to the GPU to process, freeing up the computer's CPU to run other tasks. Using GPUDirect, multiple GPUs, third party network adapters, solid-state drives (SSDs), and other devices can directly read and write CUDA host and device memory, eliminating unnecessary memory copies, dramatically lowering CPU overhead, and reducing latency, resulting in significant performance improvements in data transfer times for applications. By connecting up to four compatible Quadro GPUs to a separate Quadro Sync board you can perfectly synchronize the display outputs of all the connected GPUs for critical video wall and extended desktop applications utilizing multiple displays. Quadro Sync also enables NVIDIA Quadro Mosaic technology on those synchronized displays and projectors, providing an easy way to scale the resolution of any application. Quadro Sync II allows for two Quadro Sync cards to be used in the same system, enabling support for up to 32 displays with stereoscopic visuals and support for projector overlap, and WMI (Windows Instrumentation Management). Leverage multiple displays to easily span any application across multiple displays or projectors from a single workstation, without sacrificing performance or power. Combined with NVIDIA's nView desktop management software you also get bezel correction and projector overlap for seamless multi-display exhibition. Store your data in the 256GB 860 PRO SATA III 2.5" Internal SSD from Samsung for quick access. It features sequential read speeds of up to 560 MB/s and sequential write speeds of up to 530 MB/s, making it ideal for storing and rendering large format files such as 4K video and 3D data. Moreover, it has a 2.5" form factor, which is compatible with a wide range of notebooks and desktop computers, and utilizes the SATA III interface. With a refined ECC (Error Correction Code) algorithm and MJX controller, the PRO 860 is able to provide you with fast data transfer speeds. Download Samsung's Smart Magician software to track your drive's health, performance, and install new updates. The 2.5" to 3.5" Hard Drive Adapter Bracket from Pearstone is designed to fit a 2.5" drive into a 3.5" drive bay. Use it to install a solid-state drive or a laptop drive into a desktop computer for extra storage. Box Dimensions (LxWxH) 23.0 x 14.0 x 12.0"
Box Dimensions (LxWxH) 6.7 x 1.7 x 0.4"
Box Dimensions (LxWxH) 16.7 x 8.7 x 3.3"
Box Dimensions (LxWxH) 5.6 x 3.9 x 0.9"
Box Dimensions (LxWxH) 4.6 x 4.3 x 0.8"